(a) Should be a JCO or NCOClk (having adequate knowledge of Accounts and computer). (b) Should not be more than 55 years of age as on 1.1. 2018. (c) Minimum Education Qualification BA/B.Sc/B.Com with typing speed 35 words per minute. Education Qualification certificate issued by Army will also be considered. Working knowledge of computer is a must. (d) Should bear an Exemplary Character at the time of retirement from Defence Services. (e) Should be in Medical Category Shape-I. (f) The candidate will not claim the seniority/permanency of the service rendered by him. (g) It is a contractual post and hence no pensionary or terminal benefits for the service rendered can be claimed. Max terms of engagement will be 60 years of age or 10 years of service whichever is earlier. (a) Matriculate Certificate with Date of Birth. (c) Attested copy of discharge certificate. (d) Advance Diploma in computer applications for a period of not less than six months. (f) Certificates of Academic Qualification. (g) Marks Certificate of each examination passed. (h) Experience Certificate, if any. (i) A self addressed envelope duly stamped. Incomplete applications will not be considered. 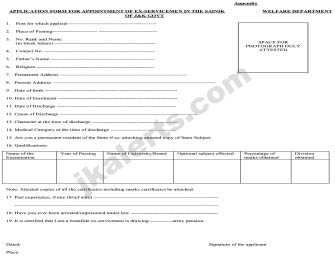 The department has full right to reject the application forms not meeting the eligibility. Eligible ex-servicemen will have to appear for a written test and interview at the place, to be intimated later, at their own expense. The candidates who apply for the post and do not get call letters for Written Test/Interview will not seek reasons for rejection of their applications from the department.